French’s Polymer Machinery Group manufactures dewatering screw presses and drying equipment all types of synthetic rubber and other polymers such as ABS plastic. French dewatering screw presses and extruder dryers have long been recognized as industry leaders. French equipment is used by synthetic rubber producers in over 23 countries. French engineers custom design each machine to meet the customer’s specific requirement. 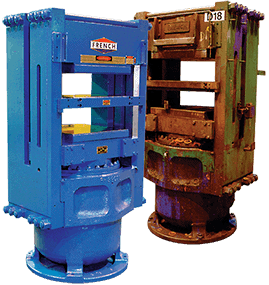 By utilizing well-proven screw designs and unique adjustable cone mechanisms, French dewatering screw presses can perform at higher capacities and consistent discharge moistures. Equipment capacities range from 50 kg/hr for pilot plant equipment to 12 metric tons/hour for commercial size equipment. The Super Dewatering concept enables customers to dewater and dry materials to the 3% moisture range with just one machine. This lowers installation and operating costs and, because of operation at lower temperatures, delivers better quality. French Mechanical Dryers are available in two types: Expansion type extruder dryers and vented mechanical dryers. Mechanical dryers are used in series after our dewatering presses. Aftermarket Sales offers a complete line of replacement parts for French Polymer Machinery, as well as rebuilding services for used French dewatering screw presses and extruder dryers.